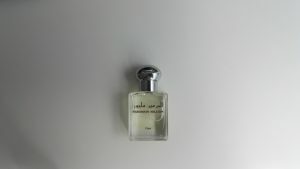 The Haramain brand is well known for Arab clothing, few knew they also made perfumes. This review is on their “Million” fragrance. 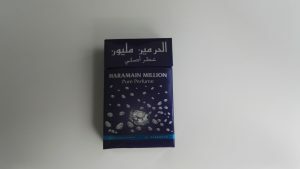 Coming in a cigarette style packet, the Haramain Million 15ml bottle looks far beyond the sub £5 price would suggest. The cheapest I have seen this is on Amazon with this link : Limited edition “Haramain Million”. The liquid is clear and has a roller type applicator. I found the roller ball seemed to transmit a small amount of the perfume, so you have to roll for quite some time to get a convincing amount. The scent and style is a replica of the Paco Rabanne Million. The strongest tones are of vanilla and lavender. These creates quite a sweet overall scent, by western standards this level of sweetness would be classed as feminine. From an eastern perspective its more unisex, I would say it leans towards being feminine however. I personally found the scent pleasant, but slightly thin, it didn’t seem to last that long. 7|162|But the wicked among them substituted other words for the words given to them; so We sent down upon them a plague from the sky, because of their wrongdoing.